Kick Back in Style with the Best Outdoor Recliner Chairs. The recliner is often the go-to chair in the living room. And as more and more people create outdoor living room spaces, having an outdoor recliner is a must. 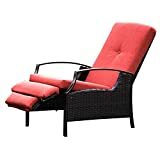 After looking at several different models, we have found that the best outdoor recliner chair is the PE resin wicker recliner from ART TO REAL. It is the fourth recliner out of the set we’ve reviewed below. One of the major factors helping it stand out above the rest was the quality of the cushions. Given that cushions can be costly on their own, it’s important that the recliner of choice comes with good ones so that you don’t need to go spend even more on another set after a few years. Replacement cushions naturally come with their own set of hassles, namely finding ones that fit or match. Besides the cushions though, the frame is stylish, it is large and spacey, and is overall well made. For more information on the Art to Real chair, see our Product Reviews section below. The runner-up best outdoor recliner goes to La-Z Boy’s Sawyer line. While it is on the expensive side, it is solidly built and comes with name recognition, both the La-Z Boy brand and the Sunbrella fabric. The only downside may be the cushions, which some have mentioned has a little bit too thin for the chair, which is one of the main reasons it is just the runner-up. For more information on the Sawyer line, see our Product Reviews below. The Odina by Great Deal Furniture provides a great budget option for an outdoor recliner. As noted in its review below, it is a bit on the smaller side, so it may not be for everyone. But it lacks the problems that some of the other budget options have, such as difficult assembly or a short lifespan. For more information on the Odina, see our Product Reviews section below. In this section, we will closely examine five of our favorite outdoor recliners. We will consider the positives and negatives of each, and pick our favorites. If you’re looking for more of a rocker than a recliner, be sure to check out our outdoor rocking chair information! 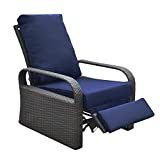 The Best Selling Furniture PE Wicker Outdoor Recliner is a simple, practical outdoor recliner chair, positioned at a fairly good price point. It’s hard to get super enthusiastic about the design (perhaps a white cushion set would look better? ), but it is fairly nondescript and is reasonably configurable. Assembly is pretty easy, and the Best Selling chair is positioned at a pretty aggressive price point, but there are a couple of drawbacks. Contact the seller directly for more information regarding their warranty. This outdoor recliner by Best-Selling is modest, sturdy, and simple. 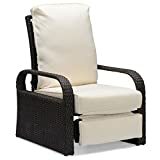 Its aluminum frame combined with polyethylene wicker (further abbreviated, “PE”) ensures that the recliner itself should be able to withstand the elements. Assembly is rather on the easy side: just snap the back down onto two poles and then put the cushions on. To ensure its longevity, wash it occasionally with a soap and water solution, keep it covered when not in use (if it’s not in a screened-in porch for example), and bring it inside during the offseason. As for the overall functionality of this outdoor recliner, we find it came up just a bit short. There are major areas where this recliner falls a bit short. The first is that many find it difficult to actually use the reclining function. Considering this is really the sole purpose of these chairs, that can be an annoyance over the long term. The other problem many run into with this chair is that when it is not reclined, it is impossible to kick up the leg stand. This prohibits it from helping users achieve maximum comfort. Despite the two downsides, the Best Selling Outdoor Rocker is still an option to consider. Being on the rather inexpensive side, one might consider it a budget option if they are so inclined, and be prepared to replace the cushions or the whole chair after a few years. However, further down on this list there may be another rocker that fits your needs better. 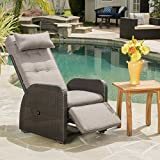 The Naturefun Indoor/Outdoor adjustable recliner is a comfortable outdoor chair that has reasonably contemporary lines, and a comfortable design that will make lounging on the patio a delight. It’s only available in the color configuration shown, with the red cushions. We can’t say we love the cushion color, and the red is prone to fading, so be sure to store these cushions in a deck box or garage when not in use, to prolong their life. Best described as a budget option, this recliner chair by NatureFun comes in at a considerably cheaper price than the others. With that said, it’s not without its downside – there are a few problems inherent with this recliner as noted by many who have bought it. Unlike the previous recliner, where you simply snap in the pieces and throw on the cushions – this assembly will require significantly more effort. Beyond assembly, this chair has a number of smaller issues with functionality as a whole. A few describe it as hard to recline, and the folding mechanism is rather lightweight, so it doesn’t hold up well for heavier people. At worst, some have encountered problems with the material ripping after only a few months of use, as well as excessive fading when its left in the sun. On the upside, the polyethylene wicker accompanied by the powder-coated steel tube should hold up for quite a while. It is just the cushions that are questionable. The overall design seems well put together, so if it comes down to it, using your own cushions may be in the best interest if these eventually do fail. It is safe to say there are better options than the Naturefun chair available if you’re looking towards the long-term and are willing to spend a bit more. There are significant issues with assembly here, and the fading cushions are another problem. Custom cushions could easily add up to the same price as the entire chair! We’ll cover some recliners next that have solid longevity while maintaining a great look. The La-Z-Boy Sawyer outdoor recliner has many strong points, not least the La-Z-Boy and Sunbrella names! The styling of the Sawyer line of outdoor furniture is a bit too curvy for our tastes, but it is undeniably attractive. The Sawyer line has a few different furniture options, is our runner-up among the best patio conversation sets. Available in two Sunbrella fabric options, this outdoor recliner is high quality and is built to last. It is an excellent outdoor recliner, though its price reflects the quality. There is a 1-year warranty on the steel frame, 5-year warranty on the Sunbrella fabric, and a 1-year warranty on the weave. La-Z Boy’s recliner comes with 3 adjustable settings for choosing the comfort of your choice: upright, elevated leg, and full recline. It has a powder-coated, rust-resistant steel frame which accompanies its hand-woven resin wicker, ensuring its durability. In addition, the fabric of the cushions is Sunbrella, which is one of the highest quality outdoor fabrics one can find. It’s also worth noting Sunbrella provides a 5-year warranty on all their fabric. Compared to the other recliners reviewed thus far, you may be happy to hear that assembly is relatively easy. The only complaint is one that so far has been a common theme – the cushions. While there haven’t been any reported issues of tearing (they are Sunbrella after all, so the fabric itself should hold up quite well) some may find that the cushions are a little bit on the thin side, which means they aren’t going to be quite as comfortable compared to the others. 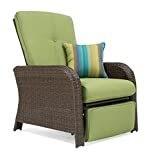 This La-Z Boy outdoor recliner is a comfortable, well made, and sturdy outdoor recliner. It is attractive, but nondescript enough to fit into any number of patio design settings. Its only downside may be the cushions which some may find on the thin side, but it is a solid unit overall otherwise. And you can shop for a matching outdoor set to go with this patio recliner if you’re so inclined. Art to Real has one of the more attractive and high-quality wicker outdoor recliners on our list. In terms of both design and comfort, these recliners are a step up. With four different cushion colors to choose from, and a lightweight but robust aluminum frame, these chairs are quite high quality and are meant to bring lasting comfort outside. For warranty information, contact the manufacturer directly. ART TO REAL has produced a solid all-around brown wicker recliner. The brown wicker and white cushions give a contemporary feel which should fit in most locations. Assembly comes rather easily, as everything is packaged with instructions, and there is even a PDF online to help clarify. The frame is powder coated aluminum, meaning it is more lightweight than its steel frame counterpart but still rust resistant and sturdy. Fortunately, these cushions are waterproof, which should help their resilience compared to some of the previous recliners and their common cushion problems. These cushions are made from soft sponge which is inside a waterproof zipper. Not only does that help protect it from rain but it is also easier to clean than a regular cushion. We believe these fabrics are Sunbrella, which is always a plus in holding up for the long term. There is an optional chair cover that goes with this outdoor recliner, and we strongly suggest you pick it up and use it (or pick up another outdoor furniture cover). The better protected the chair from the elements, the longer it will last. Simple as that. Art to Real’s outdoor recliner has a quality level that is among the highest on our list, with a price comes in at the middle of the pack. That combination makes it our pick as the best outdoor recliner chair! Consider this option if you don’t mind spending a little bit more than the budget options but would like much higher all around quality. Between the overall build and frame, timely responses by the manufacturer into customer inquiries, solid quality cushions, and an overall lack of any real downside, this is a quality recliner to invest in. 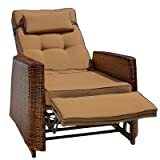 Great Deal Furniture’s Odina Outdoor Brown Recliner is a reasonably attractive outdoor recliner chair, though the proportions and size of this chair are notably smaller than some of the other options on our list today. For those who like a tighter, smaller frame on their recliner, this may be a great choice, as its price and materials selection is pretty solid, but if you like a wide chair, you should almost certainly look elsewhere. Check with the seller to see what kind of warranty is being offered. Much like the others we’ve reviewed thus far, the Odina chair comes with the standard material choice: polyethylene wicker and an aluminum frame. These materials really are the best materials to go with when searching for a recliner, as they are lightweight and robust. Where this chair differs from the competition on our list is its rather narrow design. This narrow setup may be comforting to smaller bodies but may make the Odina chair otherwise unusable by the slightly larger-than-average person. It’s definitely something to consider when looking at this recliner. Most buyers when shopping for a recliner like a chair that is wide, comfortable, and spacious and most don’t want to feel constricted in a too-tight chair. As an added concern, some have found that the chair doesn’t recline quite as much as they would like, as well. This recliner just about makes the cut for the budget category, placing it up against the likes of NatureFun, the second recliner we reviewed. Comparatively, assembly should not be overly difficult on the Odina outdoor brown recliner. If the potential narrowness or size of the chair isn’t an issue, then it is likely the better of the two budget options. Otherwise, consider one of the more mid-range chairs from ART TO REAL or Best-Selling. From the recliners we reviewed, the cushions are the source of most concern. Be sure to consider where the chair will be located, and how exposed to the sun and rain it will be. Pick up a chair cover, and understand that outdoor cushions will wear in an outdoor environment from both sun and rain. The secondary concern in many of these chairs is how much they actually recline, and how comfortable they are. We have tried to note the qualities of the recline system on these chairs. Out of the 5 recliners we’ve reviewed, the ART TO REAL came up best, with a recliner that is easy to assemble, with a great price, solid functionality (especially in regards to using the reclining feature) and has a classic look. La-Z Boy’s Sawyer Chair came up just behind them with a similar quality recliner, but just a tad bit on the expensive side comparatively.